ಬೆಂಗಳೂರು ಗ್ರಾಮಾಂತರ ಜಿಲ್ಲೆಯ ಸ್ಟೆನೊಗ್ರಾಫರ್ ಹುದ್ದೆಯ ಆನ್ಲೈನ್ ಅಪ್ಲಿಕೇಷನ್ಸ್ ಆಹ್ವಾನಿಸಿ ಬೆಂಗಳೂರು ಗ್ರಾಮಾಂತರ ಜಿಲ್ಲಾ ನ್ಯಾಯಾಲಯ. ಕೊನೆಯ ದಿನಾಂಕ 25 ಸೆಪ್ಟೆಂಬರ್ 2018. ಅರ್ಹತಾ ಮಾನದಂಡ, ವಯಸ್ಸಿನ ಮಿತಿ, ಕೆಳಗಿನ ಪುಟದಲ್ಲಿ ಬೆಂಗಳೂರು ಗ್ರಾಮಾಂತರ ಜಿಲ್ಲಾ ನ್ಯಾಯಾಲಯದ ನೇಮಕಾತಿ 2018 ರ ಆಯ್ಕೆ ಪ್ರಕ್ರಿಯೆ ಮುಂತಾದ ಹೆಚ್ಚಿನ ವಿವರಗಳನ್ನು ಅಭ್ಯರ್ಥಿ ಕಾಣಬಹುದು. ಜಾಬ್ ಸೀಕರ್ಗಳು ಅಧಿಕೃತ ಪುಟ ecourts.gov.in ಮತ್ತು careers99.com ಮೂಲಕ ಪೋಸ್ಟ್ಗೆ ಅರ್ಜಿ ಸಲ್ಲಿಸಬಹುದು. Bangalore Rural District Court Recruitment 2018-19 – Apply through Online for 20 vacancies of Stenographer posts: Bangalore Rural District Court recently released a job notification on its official website ecourts.gov.in for Stenographer posts. Candidates are allowed to apply for Bangalore Rural District Court Recruitment 2018 from 24th August 2018 to 25th September 2018. Candidate can find the further details like Eligibility Criteria, Age limit, the Selection process of Bangalore Rural District Court Recruitment 2018 on the below page. Job Seekers can apply for the post through the Official page ecourts.gov.in and careers99.com. Bangalore Rural District Court Recruitment 2018 – Apply Online for Stenographer Posts: Bangalore Rural District Court (Bangalore Rural District Court) has advertised a notification for the recruitment of 20 posts of Stenographer vacancies. Eligible candidates can apply online from 24th August 2018 to 25th September 2018. 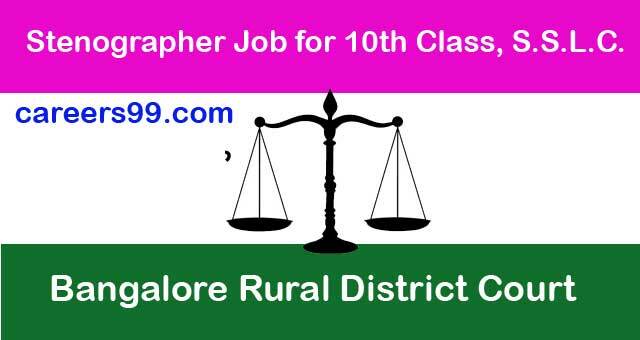 Other details like age limit, educational qualification, selection process & how to apply for Bangalore Rural District Court Jobs are given below. Educational Qualifications 10th Class, S.S.L.C. Interested Job Aspirants who are ready to apply for Bangalore Rural District Court 2018 Notification must possess the below-given Eligibility Details. Selected candidates will get Rs.27,650-650-29,600-750-32,600-850-36,000-950-39,800-1100-46,400-1250-52,650 by the Recruiting Organization.